Where do great songs come from? Author, Fredrick Buechner, says his prose comes from the place where he dreams. John Prine compared songwriting to fishing as he refers to ‘catching’ songs. For North Carolina singer-songwriter, Mitch Hayes, his best songs come from such a deep place in his soul, he feels like more of an instrument than the author of the songs he writes. Hayes began this late-in-life career as a singer-songwriter when he was 58. Today, at 62, it’s clear this is the right path for him. A life long series of dreams come true. He has recently completed a gem of a new album, Heroes, which plays like a seasoned songwriter with a legacy already under his belt. But, for Hayes, with this sophomore effort-his first independent album, My Reflections, came out in 2014-Heroes, represents the completion of a chapter in his life that has been as challenging as it has been rewarding. He remains in awe of what has been happened in his life these last five years. Front and center is the new album’s featured single, “All Fall Down,” with its accompanying video, produced and directed by Wes Cobb, which captures the mood of much of the nation; not the country that tries to elect demagogues into office for political ‘change,’ but the ones who have grown weary of the polarization and the violence that has led to so much tragedy, unnecessary violence and death. But, Hayes was looking for more with the content of the video than a focus on the violence of our times. “The video underscores the unrest but I wanted to leave some hope. The most stunning element of the video is the directors use of close-ups. He has Hayes with a straight forward and haunted close-up, as he seems to look through the camera as though he’s looking past all sense of divide and prejudice and asking everyone to come to reason. The close-up on the singer and the faces of the dancing children from different ethnicities is a gentle reminder that there are times in our lives when we need to look up from those things that have distracted and divided us as we spin in circles around politics, religion, devices, televisions and computers; we need to look into each others eyes, the eyes of neighbors and friends. Then, we may see that we are all connected through our joys and our tragedies. It is a powerful song that needs to be heard (and seen) in this particularly mean season of the 2016 presidential campaign. It may be, once we all fall-down, dust ourselves off and look and listen to each other, we may find that we are the heroes to each other we need to be. Hayes came to music through his family and his love of the music of the 60s that shaped his life. “I learned to play drums when I was thirteen,” he said. “When I got out of high school coffee houses were the rage. From that I played with a bunch of bands. After that I started writing songs,” he explained. “When I started writing I gravitated toward Bob Dylan and Neil Young. After that I did the ‘adult’ thing and got a job and started a family. In my second marriage the lady didn’t want me playing music. “I was depressed. lost.” Hayes explains. “The marriage was just not working out. My daughter Erin, recognizing this, got me out of the house and back on stage again at a local open mic. We got a standing ovation. Then we did several others. She encouraged me to start performing again, which, started to be a problem at home. I was discouraged from pursuing it. My ex-wife would say, “you’re chasing a pipe dream.” It was not long after this that I heard the words, “I don’t love you anymore, I want you to leave.” Music wasn’t the only issue, but it was a big one. I began spending time with something I was passionate about with my daughter that took me out of the house. My song Ashes and Dust is for Erin. In 2012, Hayes was declared cancer free. Then, it was time to work toward completing one album and beginning another, Heroes. Both albums are now complete and are a testament to the redemptive and healing power of music. 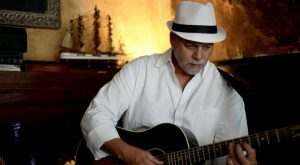 Stylistically, they reflect Hayes’ love for American music with a folk and country blend that is appealing and engaging. His lyrics are thoughtful and authentic as he looks beneath surface of things in life. The integrity comes from an artist who has transparently moved through the deep valley of loss and near-death with a divorce, cancer, and depression. But, today he is back on the path of life. His music and his family helped to transform these disadvantages into material for great songs. Hayes has been a living testament to the faith that the way out is the way through. After facing so much adversity, today he stands in the light of day with new hope for the present and the future. All of this and two albums and a budding career as a singer songwriter. The optimism that has been the result of Hayes’ life is the foundation of both Heroes and My Reflection. The songs on Heroes point to personal triumph and singular insights that always find their way around to a universal truth. Among the highlights are “Home Again,” about the longing for hope that lies at the heart of recovery from addiction. “Ashes & Dust (Erin’s Song),” is a song to his daughter who helped to bring her father back from the brink of darkness through their mutual love for music. The music on the album is acoustic based electric and steel guitars skillfully laid out with a production by Eric Lovell. According to Hayes, North Carolina is ripe with great musicians. These include his daughter, Erin Hayes and his son, Jordan Hayes. As he continues his own musical journey, Mitch Hayes has already begun on a journey that he walks today with gratitude and hope for the future.